Simply hearing Laurel and Hardy’s ‘The Cuckoo Song’ theme tune is not only guaranteed to put a smile on most faces, it’s also a reminder to fans of a more innocent age, when the success of a film or stage show relied on just the skilled performers, a few props and some well-timed sound effects – without high-tech special effects, legions of extras and huge budgets that some film stars lean on today. Now, the comedy icons’ heart-warming, humorous and bittersweet real-life story is being told in acclaimed new movie Stan & Ollie, which focuses on the final tour of Laurel and Hardy’s careers and their fight to rediscover the love and friendship they still felt for each other even after so many years as a double act. As two of the original kings of comedy, Laurel and Hardy launched their energetic brand of slapstick in a world still reeling from the effects of World War One. They carried on entertaining crowds of cinema-goers right through the period between the wars and after World War Two, turned their focus to the stage. Stan & Ollie is based near the very end of that period, when, embarking in 1953 on their final tour together around the UK, the pair face an uncertain future, with modern technologies threatening the popularity of their classic routines. While they once boasted sold-out shows, Laurel and Hardy now face empty theatres and a frosty reception. As they begin to win their audience back again, though, old tensions arise between them and Hardy’s deteriorating health threatens to bring their dream crashing down, testing their bond like never before. Instead of taking viewers back through their colourful life stories, screenwriter Jeff Pope made the bold decision to focus on the pair’s last tour in order to highlight a lesser-known part of their lives together. British actor Steve Coogan, who plays Laurel in Stan & Ollie, praises Pope for avoiding the more obvious storyline in order to depict the less glamorous, more testing aspects of their partnership and the way Laurel and Hardy negotiated through them together. 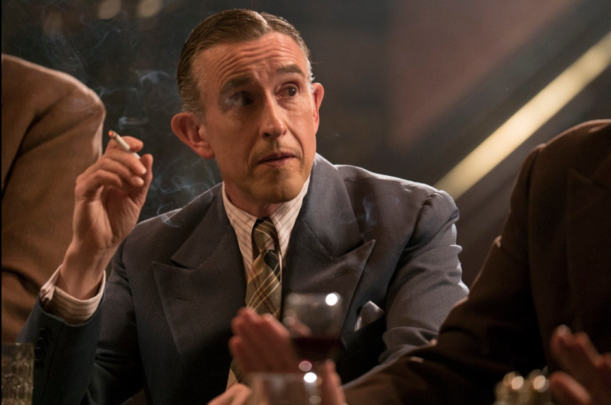 Steve Coogan plays the more pragmatic Stan Laurel in ‘Stan & Ollie’. Even the decision to name the film Stan & Ollie rather than Laurel & Hardy, as the actors were popularly known, is itself a direct reflection of Pope’s decision to celebrate the men behind the comedy legends. “The beautiful thing about this story was you go inside their relationship and it gives you a glimpse of what it might have been like working together,” Golden Globe-nominated American actor John C. Reilly, who plays Hardy, adds. There are nods to the duo’s incredible career throughout, however, as Pope took every opportunity to recreate well-known scenes from some of the pair’s films in the context of Stan & Ollie. And he had plenty of material to work with, because Laurel and Hardy made more than 107 film appearances between 1927 and 1950. A perfect example comes in a scene that sees the pair attempt to get a trunk up the stairs in a railway station, a nod to a similarly memorable piano-stairs sequence in Laurel and Hardy’s Oscar-winning 1932 hit film The Music Box. “As the script evolved, I realised there were certain points I could tip my hat to their glorious past,” Pope explains. Of course, movie fans will be treated to some of the duo’s best-loved routines and dances, proving that some comedy remains relevant no matter how many years go by. Their memorable dance to ‘At The Ball, That’s All’ in Way Out West features at several points in Stan & Ollie. It also proved an effective dramatic tool for Pope to demonstrate to viewers the pair’s declining energy on stage in their final years; in real life, some of the later UK stage shows featured several mistakes in the routine, which the film ensured were faithfully recreated. Central to the film’s narrative is the duo’s deep friendship, and the moving plot has since been described in a review by The Guardian as a “love letter to cinema’s odd couple”. “Amid the prevailing ugliness of the contemporary mood, what a lovely, generous tonic this delightful movie proves to be,” the glittering review – just one of many – concludes. 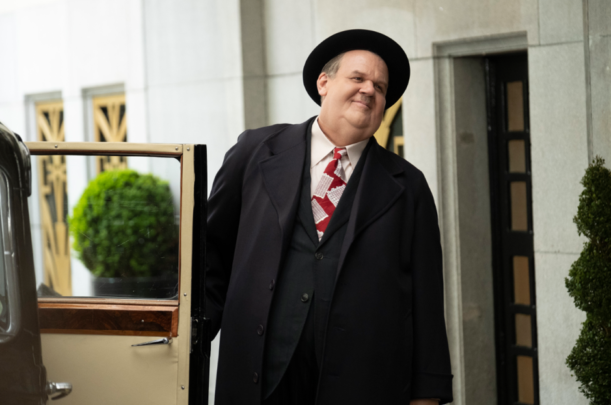 John C. Reilly plays the more ebullient Oliver Hardy. Appearing on the US morning TV show Today recently, actor Reilly explains: “It’s not just an interesting movie about two performers, but the film itself is about empathy and friends working through difficult moments in their friendship. Coogan and Reilly have won accolades for their ability to bring the iconic duo to life on screen in such a believable fashion – the two actors share an uncanny resemblance with the comedians thanks to period outfits, expert make-up and many hours spent perfecting Laurel and Hardy’s mannerisms. In fact, proving his dedication to the role, Reilly donned an inflatable suit to add weight to his figure to play the rotund Ollie, only to need cooling liquid pumped through the suit at regular intervals throughout filming to ease his discomfort while in front of the camera. It’s not just Coogan and Reilly who shine, however, in Stan & Ollie. Central to both Laurel’s and Hardy’s success were their wives and rather than keeping them in the background, the filmmakers made a clear decision to include Ida Laurel and Lucille Hardy as prominent characters. While Lucille (played by Shirley Henderson) is quiet and sensible, Ida (played by Nina Arianda) is a force to be reckoned with – and it’s those differences that offer a new level of humour to Stan & Ollie. It’s also one of the first times many viewers will get a glimpse of the real women behind the nagging fictional wives they’re used to seeing in some of Laurel and Hardy’s classic routines. Of course, there are still playful nods to those hen-pecking caricatures, but producers have also faithfully depicted the intelligence and confidence of both women – leaving viewers in no doubt that the men absolutely needed their support. As a glowing review in The Washington Post reads: “With no more than four or five scenes, Arianda and Henderson quite nearly dominate the film by showing just how strong a woman has to be to be the woman behind the man, and how she has to subdue that strength so that he can have his spotlight”. Featuring all-round stellar performances and bringing a form of comedy that has largely faded into history back to life, Stan & Ollie offers a nostalgic trip down memory lane for slapstick fans, as well as a beautifully told story celebrating the unique bond of friendship for film fans. Stan & Ollie opens in cinemas across Australia on February 21. Steve Coogan and John C. Reilly star in this touching portrait of Laurel & Hardy as they set out on their now legendary 1953 tour of Britain. From acclaimed screenwriter Jeff Pope (Philomena), Stan & Ollie pays homage to the original kings of comedy, celebrating a unique friendship and brilliant working partnership with humour and warmth.